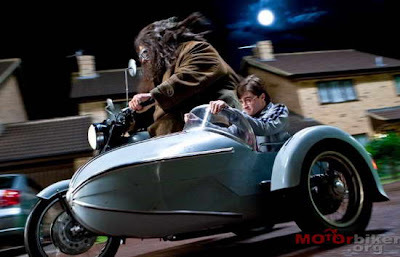 A Royal Enfield motorcycle and its sidecar appear in the new Harry Potter movie coming to theaters Nov. 19. But it took more than one Royal Enfield outfit to make a movie — seven of them in fact. The Harry Potter movies are the highest grossing film series in history. The Royal Enfield motorcycles will appear in the final two, starting with Harry Potter and the Deathly Hallows, Part 1. That they're there at all is due to Watsonian Squire, distributor of Royal Enfields in the United Kingdom. The company seems a perfect fit for the young, British accented wizard. According to its website, "Watsonian Squire Limited is one of the longest established companies of the British motorcycle industry. Founded in 1912 by T. F. Watson, the company has been manufacturing sidecars in the Heart of England ever since. In 1984 Watsonian merged with the... young Squire company to create the UK’s biggest sidecar operation." "I was approached a couple of years ago by a company that specialises in sourcing vehicles for movies; they were looking to purchase some sidecars from us for the next two Harry Potter films. I managed to persuade them that they also ought to use Royal Enfield's! "We sold them seven outfits in total, most of which have been heavily modified by the special effects department; some have been adapted for flying rigs, some have been ridden into a lake! "We are currently speaking to Warner Brothers about getting one of the bikes back so that we can have a Harry Potter feature at the UK's largest Motorcycle Exhibition in November (but this hasn't been confirmed yet). "The bikes are no longer in a condition that is suitable for the road, and it sounds like Warner Brothers will keep all the outfits (they have kept all the vehicles from previous films). "In our ongoing discussions with Warner we are discussing assisting them with UK premiers, etc. We are not allowed to use the film to endorse our products, but we are currently looking at a whole range of ideas to ensure the world knows that the bikes in the Harry Potter film are Royal Enfield's, and of course fitted with our sidecars too!" This is absolutely magical. In a stroke, Royal Enfield motorcycles will become visually familiar to people, many of them young, all over the world. Think what Steve McQueen did for the Ford Mustang in Bullitt (1968) and (for those who recognized the bike) Triumph in The Great Escape (1963). Someday, we may realize that, for Royal Enfield outside of India, Nov. 19, 2010 is when it all began. Wow and that shot above fantastic. I can see vintage motorcycle gatherings at Harry Potter movies. You're both right! Not that Wikipedia is the world's best source, but it says: The chase scene had Bullitt in a dark "Highland Green" 1968 Ford Mustang GT 390 CID Fastback, chasing two hit-men in a "Tuxedo Black" 1968 Dodge Charger R/T 440 Magnum.